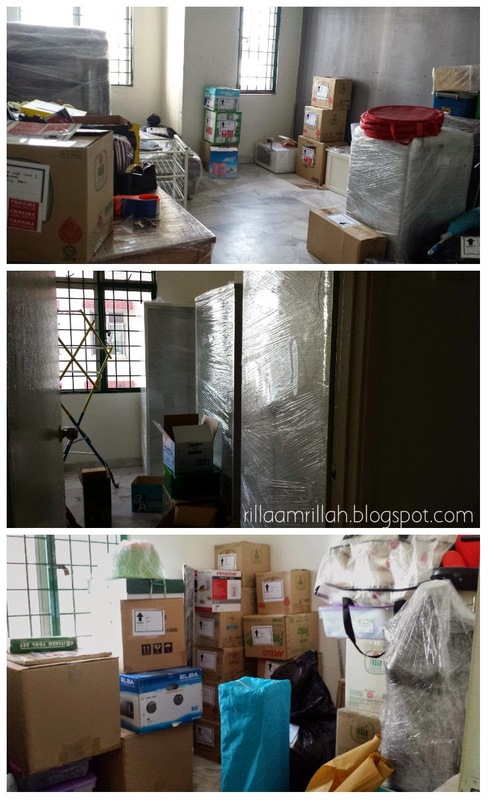 Alhamdulillah, we have moved into our new nest. Packing and unpacking, who like them? Exhaustive and seemingly never ending. Kemas-kemas tengok ada je lagi barang. We started to pack about a month earlier. My advice? Start even earlier than that! Plus, I have my sweet little helper. I mean he's adorable and all - taking out stuff that I've put in a box - but it takes twice as much time. I just wait until he's asleep and burnt the midnight oil and packing stuff. It's OK Zain, Bonda doesn't really need sleep =.= I'm thankful that the family came and helped us pack our stuff and wrap the big furnitures with stretch films. Our stuff at the old house. Now, on the moving day itself (last Monday), so much drama! We originally dealt with this one mover. We've set the date and time and got the driver's details to be submitted to the management office. They were supposed to come at 10.30 ish, and so we waited. But until 11, there's no sign of them! And to make things worse, they didn't pick up our calls! After trying for the umpteenth times, we've manage to speak to them. It turns out that they required booking payment to secure the lorry (in which that we've overlooked, I must admit - we just assumed that the slot has been booked). So ... no lorry ... panic ensues! Googled for moving service. Fortunately we found one and managed to secure a lorry. Good thing that they can even come that noon. So relieved after they came. Load 'em up baby! I took the photo above in the comfort of my car, holding Zain, maxed-out the aircond and sipping Ribena! A "mem besar" moment there, haha. Yup, I didn't lift even one box. Good thing with the lorry drama though. We asked for a 3-tonnes lorry with the original mover but got 5-tonnes lorry with this one. 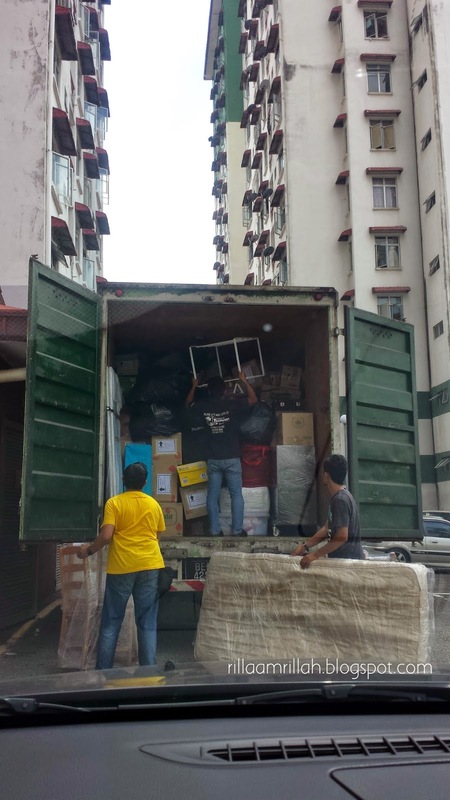 The lorry's capacity is maxed-out. I even got out of the car and said to Kanda "Sayang, banyaknya harta kita! ", LOL. Masa kemas rasa macam tak banyak. Unloaded stuff. I just close my eyes and imagine they will magically unpack themselves every time I look at this picture. We finished unloading the lorry close to 4pm. Thank you so much to those who helped. Now ... unpacking .. I'm guessing it'll took 2-3 months to do it all. Sementara tu? 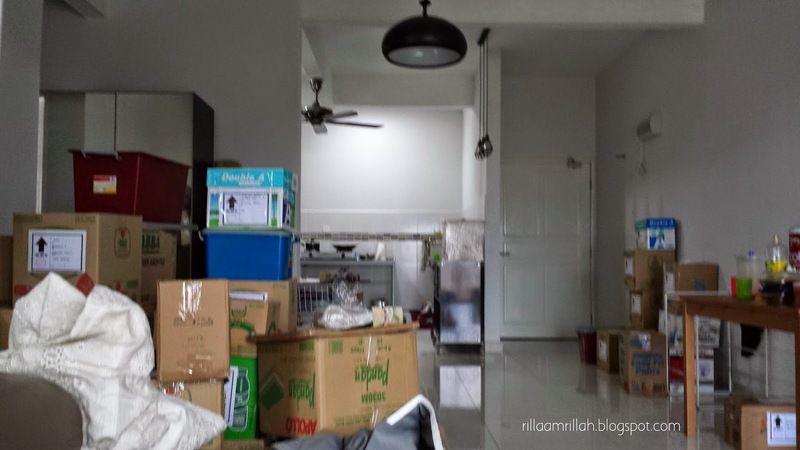 hadap je lah rumah bersepah. Asal boleh hidup konsepnya. My advice..kemas pelan2. I dah bape bulan pindah pun there's still stuff dalam kotak lagi (ok. I mmg pemalas sikit). And there's still some stuff left kat rumah MIL..
That's my plan too. Kemas pelan-pelan, haha. Especially ada pembantu peribadi kan? I unpack our stuff in one day. Yez, seriously haha. Left kalif with my mil for a day, siapkan kemas semua dengan my sil and finished by 2. Couldnt believe it myself! Happy berkemas rilla!everytime i nampak sign lorry sewa i msr teringatka u :) . Whoaaa...champion! I tak boleh kot siapkan sehari, nape tah banyak sangat barang. Good idea jugak tu. I nak clearkan 1 room so that I can do the same. I pon ingat I tak banyak barang..rasa macam sikit je. Even dah pack masuk kotak pun, our 3rd room tu tak penuh pon. Tapi bila dah kumpulkan..nah! selori!